The Whakarewarewa Forest is one of the oldest exotic forests in New Zealand. Although it is primarily a commercial forest, it still has a diverse range of exotic tree species and mix of native plants and shrubs. Of 170 different tree species planted in the Whakarewarewa Forest as part of the trial in the early 1900s, only a handful remain today. The largest varieties can be found between Long Mile Road and the Tokorangi ridge line. From these original trials Radiata Pine (1900) (Monterey Pine) adapted to the conditions well and has become the most important commercial species in New Zealand. It also makes up most of the Whakarewarewa Forest. Other small areas of Patula Pine (1941), Tasmanian Blackwood (1906), Douglas Fir (1905), Australian Eucalypts (1903), Tasmania Oak (1900), European Larch (1901), English Walnut (1903), Japanese Cedar (1913), Mexican Cypress (1969), Oriental Plane Tree (1902), Silver Wattle (1924) and various Acacias (1940) survived, along with the Californian Redwoods (1901). The 6 hectare stand of Californian Redwoods is named the Redwood Memorial Grove and is protected from tree harvesting. Redwoods can also be found near Lake Rotokakahi (the Green Lake) and in various other spots within the forest. But none of them are as magnificent as those in the Redwood Memorial Grove. The upper canopy of exotic tree species provides shelter and shade to a kaleidoscope of ferns, shrubs, flowers and fungi. 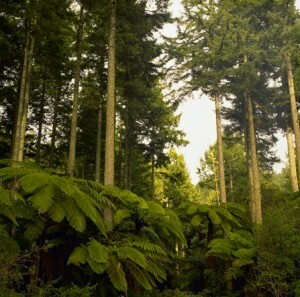 The understory of mostly native plants is an integral part of the forest eco-system and adds greatly to the scenic value of the forest.Ferns are commonplace in the New Zealand landscape with about 200 native varieties throughout the country. They have evolved into forms that can cope in just about any environment so it is no surprise that one of the most noticeable plants dominating the understory in the Whakarewarewa forest is the fern. The Ponga or Silver Tree Fern is one of the most distinctive with its silvery white stalk and underside of mature fronds. It is one of New Zealand’s national emblems shown clearly on the uniforms of our national sporting teams. The Wheki or Rough Tree Fern is the most common of the tree ferns and grows in abundance. Maori once used this fern for forming walls of their houses as it lasts well in the ground. Today it is still used for fences and steps and to define forest tracks. The Mamaku or Black Tree Fern is the most spectacular of the ferns. Growing up to 20 metres tall the fronds arch out from thick black stalks. This is the largest of the tree ferns and was very important to Maori in times gone by, being used as food, medicine and lining for food stores. Aside from ferns a variety of spleenwort, pittosporums, coprosmas, native fuchsia, manuka and tree re-growth can be seen. A spattering of brightly coloured imports such as foxgloves and the unfriendly invasion of blackberry, scotch broom and buddleia is also present.